Alfred Melville Pride (1897 - December 24, 1988) was a U.S. Navy admiral and pioneer Naval aviator, who distinguished himself during World War II as an aircraft-carrier commander. A native of Somerville, Massachusetts, he studied engineering at Tufts University in Boston for several years before dropping out to enlist in the Navy during World War I. He served first as a Machinist'M mate in the Naval Reserve, but was soon given the chance to receive flight training and gain a commission as an ensign. Pride was sent to France, where he served briefly during the latter part of the war. In the early 1920's, having joined the Regular Navy, Pride became involved in the experiments to develop U.S. aircraft carriers. He served aboard the USS Langley, the converted coaling ship that became the Navy's first aircraft carrier, and also took part in the development of the carriers USS Saratoga and USS Lexington, as a member of the original crews. Pride continued his work in Naval Aviation testing for the rest of the interwar period. He went on to study aeronautical engineering at the Massachusetts Institute of Technology (MIT). In 1931, he became the first person to land a helicopter on an aircraft carrier. From 1934-1936 he headed the Flight Test Section at Naval Air Station Anacostia, Washington, D.C., at that time the Navy's center for aircraft testing. During World War II, Pride served as first commanding officer of the carrier USS Belleau Wood (CVL-24). He received promotion to Rear Admiral and became Commandant, 14th Naval District, at Pearl Harbor, Hawaii. He then was moved out to Fleet jobs, including command of Carrier Division Six and Carrier Division Four. After the war, Rear Admiral Pride held important positions relating to Naval Aviation's technical development. From 1947-1951 he served as Chief of the Bureau of Aeronautics, the Navy's material organization for aviation. From 1952-1953, he commanded the Naval Air Test Center, Patuxent River, Maryland. He returned to the Pacific in 1953, when he received promotion to Vice Admiral and command of the U.S. Seventh Fleet (December 1, 1953 - December 19, 1955). During this time, he was featured on the cover of the Time magazine (February 7, 1955 issue). Pride served as head of the Seventh Fleet until 1956, when he became Commander, Air Forces, Pacific Fleet. 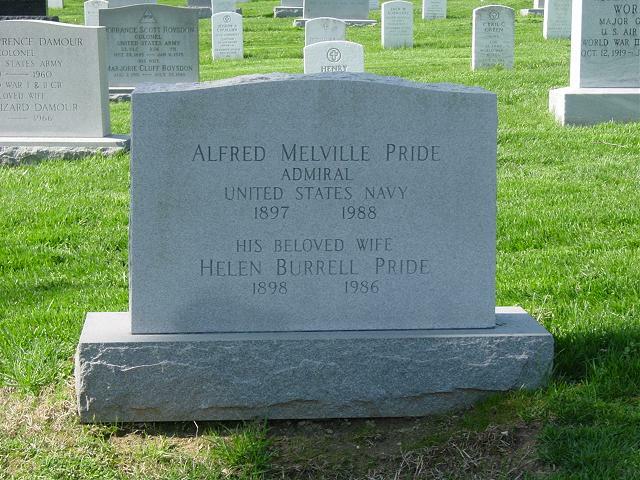 Pride retired in 1959 as a full Admiral and settled in Arlington, Virginia, where he died in 1988, aged 91. He is buried in Arlington National Cemetery in Arlington, Virginia. Many of his papers are stored at the Archives Division of the Smithsonian Institution's National Air and Space Museum, Washington, D.C.
His honors included being a Companion of the Naval Order of the United States and a member of the National Museum of Naval Aviation's Hall of Honor. The Navy Department also established the Admiral Alfred M. Pride Frigate ASW Readiness Award, for excellence in Anti-Submarine Warfare in the Navy's surface force. In 1961, Pride was retroactively designated the ninth recipient of the Gray Eagle Award, as the most senior active naval aviator from July 1959 until his retirement later that year. Posted: 1 December 2006 Updated: 8 July 2007 .